Remember the post where I admitted sometimes I don’t feel like cooking? Well, the truth is the week I wrote that post I didn’t feel like doing anything. I didn’t even go to yoga for eight. days. straight. For whatever reason (primarily the 700-degree weather) I could barely muster the energy to do much else besides a daily bed-desk-couch routine. I was spent. The good news is I’ve been on this planet, as me, for long enough to know the feeling would eventually pass. So I allowed myself to give into the fatigue and didn’t ask any more of myself than I knew I could offer. And, sure enough, in time the sluggishness wore off and I started to feel like Paige again. This helps explain why, in the past week, all I’ve wanted to do is cook. My mind is racing with recipes and I’ve been to Whole Foods so many times in the last five days I should’ve earned some frequent flier miles or at least a free bunch of garlic scrapes by now*. What have I been making? Since Friday I made these chicken drumsticks. I created a healthy pumpkin soup recipe for a Fall publication and tested it (more on that when I’m able to post it). I cold-brewed iced coffee. I made a giant fruit salad. And I made this bowl of goodness. Yesterday, I felt like I constantly bounced between my computer and my kitchen making this salad. Whenever I’d have a little gap of time between doing phone interviews for stories I’m writing I’d steam, chop, or blend something. At least this week, the kitchen has truly been my happy place. I’ve also been going to yoga every day. To keep me feeling happy and energized, I’ve got this fabulous salad of health sitting in my fridge. When attempting to describe it, I think the best place to start is with the ingredients. I realize it’s a long list, to be sure, but it makes a lot of salad and I plan on eating it for lunch for all of eternity. Or at least until Thursday. So here it goes. Ready? OK! 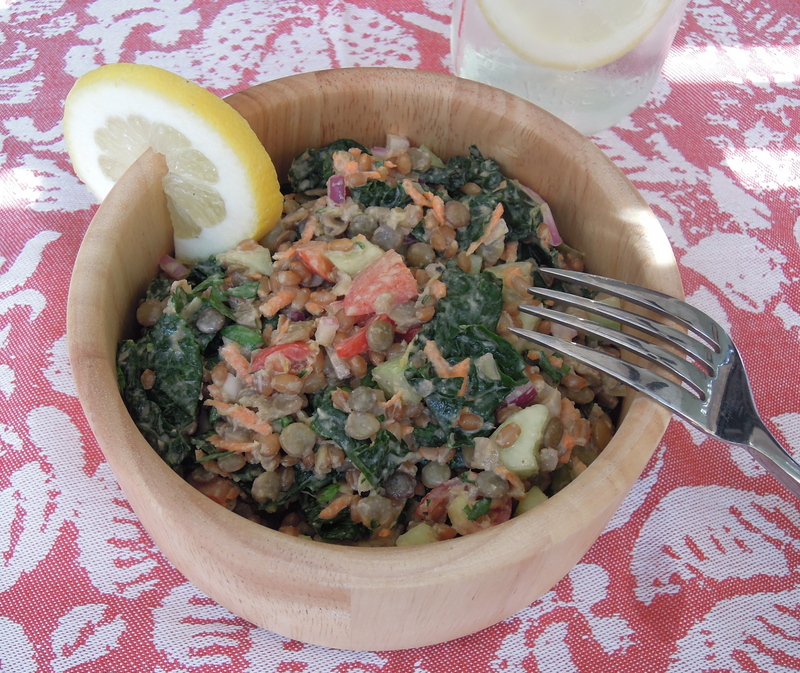 NOTE: The wheatberries and lentils don’t need to be soaked before cooking. To cook wheatberries: Bring 3 cups of water to boil in a saucepan. 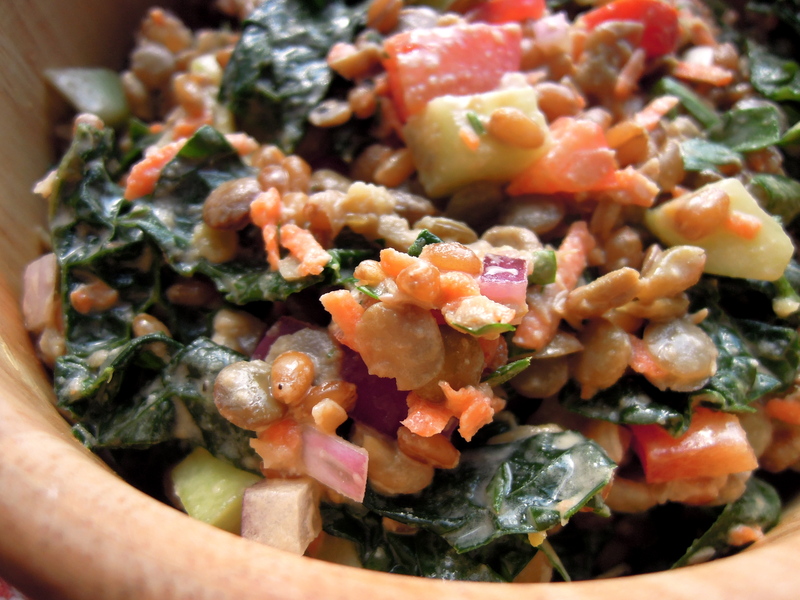 Add 1 cup uncooked wheatberries and cook, uncovered, over low heat for about 45 minutes until soft. Drain. To cook lentils: Bring 4 cups of water to boil in a saucepan. Add 1 cup uncooked lentils. Simmer with lid tilted for about 20 minutes until done (for the salad you still want them to be a little firm and not completely soft). Drain. To steam kale: In a wide pan, bring 1 inch water to boil. Add kale, cover, and cook until kale wilts about 3-5 minutes. Drain. 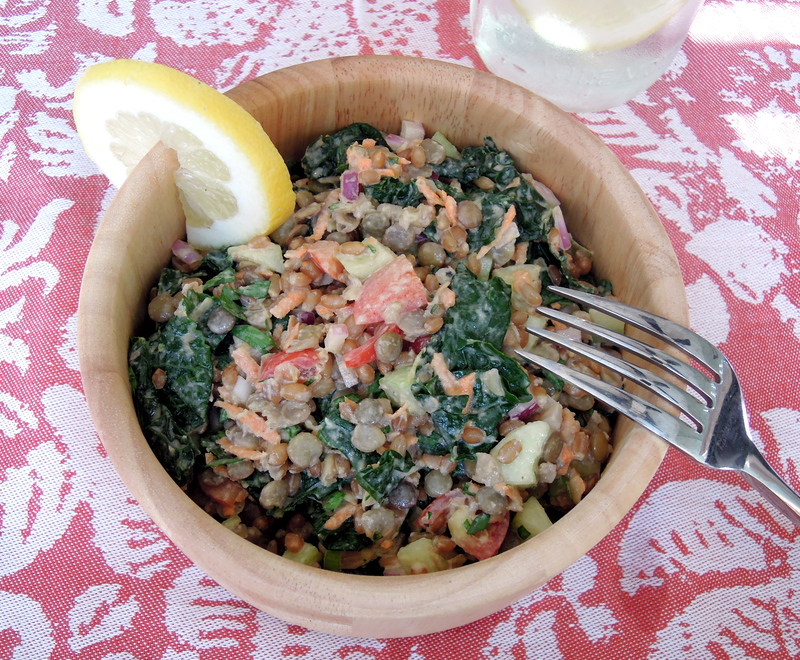 For the salad: Combine wheatberries, lentils, kale, red onion, green onion, red pepper, carrot, tomatoes, and parsley in a large bowl. Season with salt and pepper. Add zest of about 1/2 of a lemon. Combine ingredients in a food processor or blender and blend until smooth. Add additional water or lemon juice to thin dressing to desired consistency. Pour dressing onto salad and use tongs to combine evenly. Taste and add more salt, pepper, parsley, or lemon zest as desired. *I’ve never actually purchased or cooked with garlic scrapes before. This entry was posted in Salad, Vegetables on July 10, 2012 by Paige Greenfield. A Balanced Life Cooks <Liked it!